It developed the projections to prevent pedestrian fatalities and for autonomous vehicles. 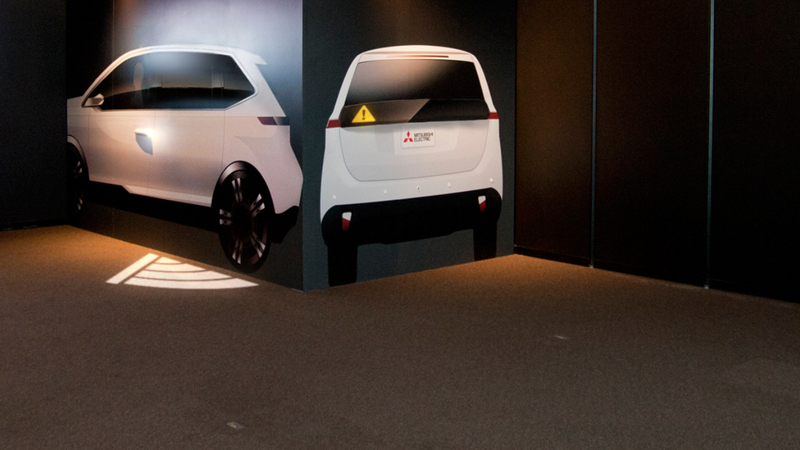 Mitsubishi's experimental Safe and Secure Lighting system takes turn signals to the next level. Instead of tiny blinking lights, it uses big road-surface projections coupled with car displays to inform pedestrians and other vehicles what you're going to do. When the car is in reverse, it projects big illuminated arrows pointing backwards. Ready to step out after parking? The rear glass shows a stop sign and the door projects a signal that clearly states you're going to open it. The best thing about it is that it automatically activates based on your actions. Unfortunately, the current version doesn't seem to have illuminated signals for right or left turns yet. Mitsubishi developed the system in an effort to prevent pedestrian fatalities, which frequently occur at night. Further, it believes the large, illuminated signs could help communicate the actions of self-driving vehicles that could be hard to interpret -- after all, people won't switch to autonomous cars all at once. The automaker plans to refine the system even further, so someday you might not have have to bother with remembering to use your turn signals. For now, though, Mitsubishi will exhibit the system's current version on an electric EMIRAI 4 concept car at the Tokyo Big Sight exhibition from October 27th to November 5th.